Country superstar Luke Bryan will be joining Chris Stapleton, Kid Rock, Larry The Cable Guy, and Travis Tritt to celebrate with Charlie Daniels at his 80th Birthday Volunteer Jam on November 30 at Bridgestone Arena. Bryan, one of the biggest names in country music known for hits like “Country Girl (Shake It For Me),” “Drunk on You,” “Play It Again” and more will join Daniels on stage for what will be remembered as one of the best Volunteer Jams to date. Tickets for the much anticipated event are on sale now at all Ticketmaster locations and the Bridgestone Arena Box Office. Ticket prices start at $25.00. Joining Volunteer Jam for the first time is Cox Media Group’s Rare Country who has signed on as an official media sponsor. RareCountry.com will provide in-depth coverage of the event, including backstage artist interviews, performance footage, and more. After a star-studded 40th Anniversary Volunteer Jam last year, this year’s celebration event will feature The Charlie Daniels Band and a select bunch of their favorite musicians and entertainers on stage for an exhilarating event for the ages. Since 1974, Daniels has commissioned his musical friends and peers to come together on a “volunteer” basis to hang out, “jam” together, and entertain crowds in an unconventional, laid-back fashion unknown to any other concert event -- all while dedicating concert proceeds to worthy causes. This year’s event will feature extra special “jam” sessions with some of Charlie’s most prolific friends who want to celebrate the soon-to-be Country Music Hall of Famer, his birthday, and his many accomplishments. "This year, I will celebrate two milestones, my 80th birthday and the Volunteer Jam. It's pretty amazing that we're both alive and kicking and still going strong. Ain't it good to be alive and be in Tennessee!" said Charlie Daniels.A portion of the proceeds from the night will go to the The Journey Home Project, a 501(c)(3) non-profit co-founded by Daniels and manager, David Corlew, to help Veterans of the United States Armed Forces. 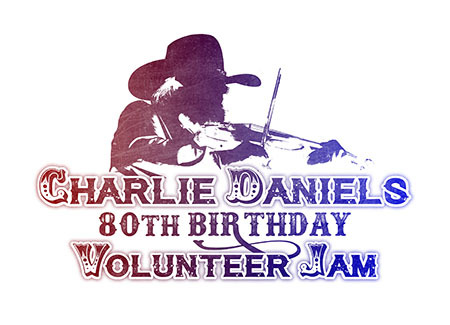 For more info on The Journey Home Project, please visit: thejourneyhomeproject.org.Charlie Daniels’ 80th Birthday Volunteer Jam is produced by Mike Smardak of Outback Concerts in association with David Corlew & Associates and Webster & Associates.